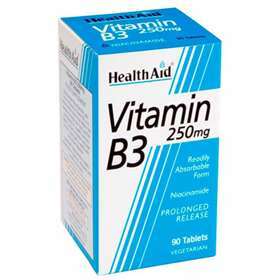 Health Aid Vitamin B3, also known as niacinamide, help the break down and conversion of carbohydrates in to fuel for the body. Vitamin B3 also supports a healthy nervous system, circulation, brain function, aids metabolism, digestion and healthy skin. Health Aid are formulated to be readily absorbed by the body for maximum effect. Helps in maintaining healthy skin and proper blood circulation. Helps normal nerve and brain functions which can help memory. Enhance circulation and reducing cholesterol levels in the blood. Yeast, gluten, wheat, soya, dairy, sugar, salt, artificial colours, preservatives and flavourings. Adults and children over 12 years of age, one tablet daily with a meal. Discontinue use or reduce intake to half a tablet if skin flushing, burning, itching or rash occurs. Bulking agent (di-calcium phosphate, microcrystalline cellulose), Vitamin B3 (niacinamide), Anti-caking Agent (veg.magnesium stearate, veg.stearic acid, silica), Glazing Agent (hypromellose).